Challenge: How do you recapture the vibrancy of a Terra Cotta roof after it has deteriorated on a home for more than a century? Solution: Install a Sonora-VariBlend Single-Width Slate roof that combines three colors of slate: Medium Terracotta, Dark Terracotta and Light Clay. As the fifth owners of the 137-year old home in Mt. 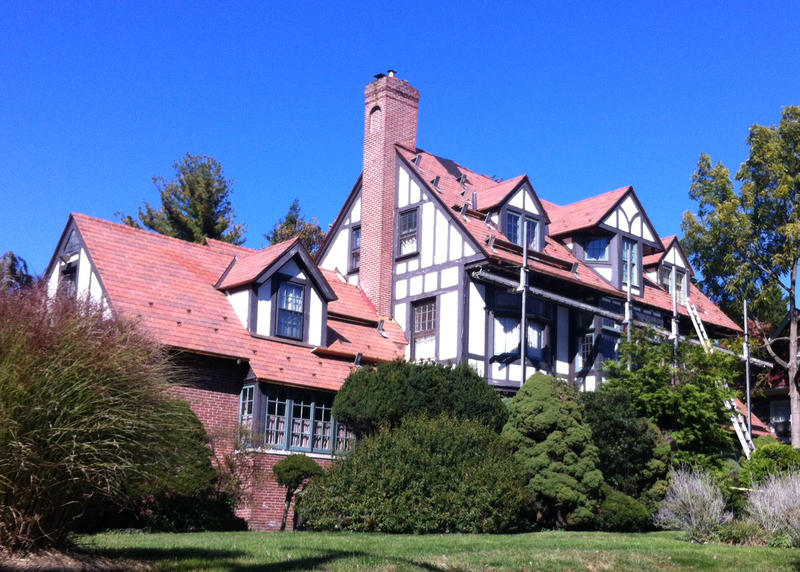 Airy, Pennsylvania, the Nasratullah family was searching for a new roof that would complement the design of their historic home. The solution came when they listened to roofer Rich Bennett's suggestion of using DaVinci Roofscapes. "A very good friend used Rich to install DaVinci roofing tiles at his home close to our house and highly recommended his company," says Ahsan Nasratullah. "We selected the Sonora blend to replicate the Terra Cotta colored tiles that were still on the roof. The majority of the roof was original with some areas replaced and maintained by previous owners. It was a hodge podge collection. "Now the new synthetic slate roofing complements the house in a way the original architect had intended." Replacing the old roof took time and patience. The original roof had to be stripped down and disposed of … and structural nightmares beneath the roofing tile had to be addressed. Between the structural remodeling, weather, detail and copper roof work, working on a turret, and the simulated slate roof installation, it took nine months for the completion of the project. "After handling the countless issues with the roof structure itself, installing the DaVinci tile was a breeze," says Rich Bennett with Bennett Construction. "Our team has a combined 60 years of roofing experience, so we were able to tackle these challenges and bring the home back to its former glory. "This home now represents the perfect combination of old world construction and modern materials." Can't get enough of colorful roofing systems? Then see Red, Red Roof and Is that a Peacock on the Roof?